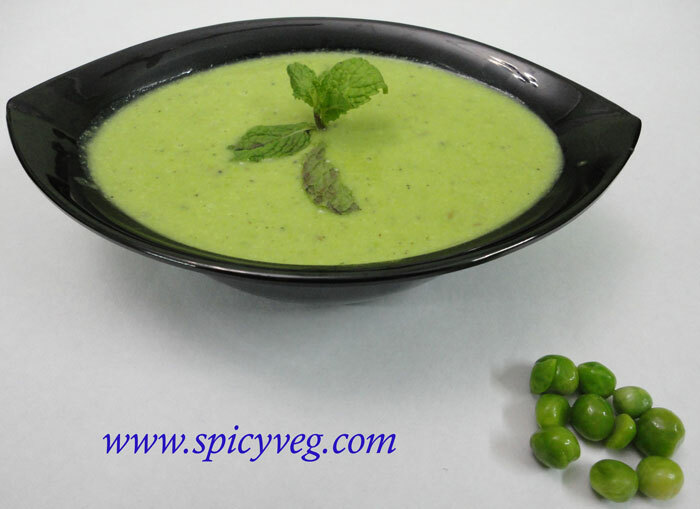 With its vibrant taste and colour, this healthy soup makes a refreshing light winter lunch or supper.Fresh spring peas cooked with a bit of onion and seasoned with mint makes a refreshing, surprisingly hearty Minted Fresh Green Pea Soup. The soup is rich and "creamy" all on its own. 1.Chop onion, mint, garlic, ginger and green chilli. 2.In a pan, add half of butter, chopped items and fry for 2 minutes just to remove raw smell. 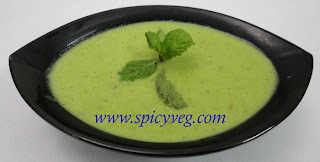 3.Add green peas, milk, 1 cup water, ¼ tea spoon sugar and cook for some time. 4.Cool and grind it to a smooth paste. 5.Now in a pan, add remaining butter, add ground peas, vegetable stock/water. 7.Before serving, mix with lemon juice and garnish with mint leaves.